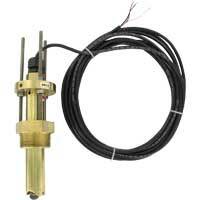 Rotating paddle sensors with electrical transmission output for remote indication of liquid flow rate. Adjustable insertion length models are available. Used to monitor liquid flow rates in pipes. Applications include irrigation, cooling systems, and leak detection. Paddlewheel Flow Sensor monitor liquid flow rates. Applications include irrigation, cooling systems, leak detection, and ground water remediation.